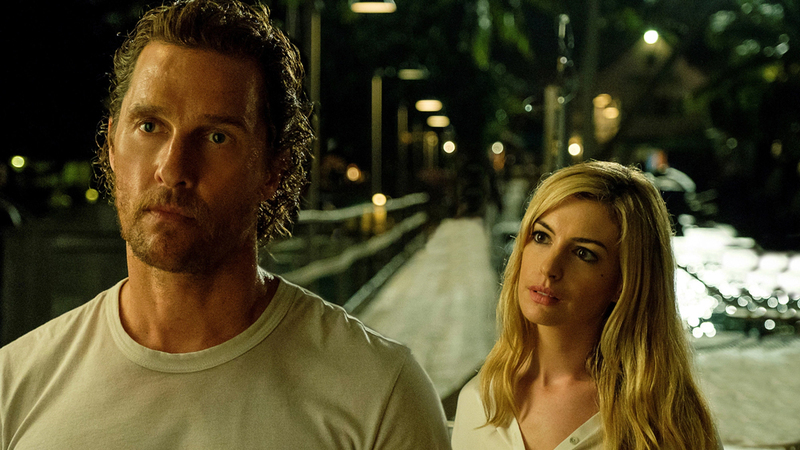 Matthew McConaughey, Anne Hathaway Sink to Bottom in "Serenity"
Breaking: The McConaissance is over and out. This was a sparkling (albeit all-too-brief) period during which the appealing Matthew McConaughey made a conscious decision to step back from the lightweight comedies and take ace roles in smart winners such as Magic Mike, Interstellar, True Detective, The Wolf of Wall Street and, of course, Dallas Buyers Club. But then came Free State of Jones, Gold, The Dark Tower and White Boy Rick. Enter Serenity, sure to be his fifth-straight dud. And between its hammy acting and dripping Gothic melodrama, this entry may be the most bargain-basement of them all. The outlandishly seedy drama is set against a easy-breezy coastal town called Plymouth Island. That’s where McConaughey’s Baker Dill — Baker Dill, people!— works as a fishing boat captain. He has all the sunshine and the privacy that he craves. He goes to bed on the regular with a local floozy. I’m pained to say the great Diane Lane plays the floozy. Baker could be bringing a bigger haul and better money. But considering that he’s an emotionally scarred war vet, he’s content in his corner of the country. This is not a photo from a lost Miami Vice episode (Aviron). His tranquil lifestyle is upended when his ex-wife Karen approaches him in his favorite watering hole. And by “approaching,” I mean that I gasped when the camera panned in close on a peaked, panic-stricken Anne Hathaway in blonde hair straight from the bottle and a fake mole painted on the side of her face. I knew she was in Serenity, of course, but I wasn’t prepared for the Oscar winning actress to opt-in for a role so thin that the character description in the script might as well have been scrawled on a cocktail napkin. There’s no time for pleasantries between the former love birds. Speaking in a broad Southern drawl, Karen catches up Baker on her life. Their loner teenaged son is doing OK, though he spends too much time playing games on his computer in his bedroom. She also has a simple favor: Her wealthy new husband (Jason Clarke) is a violent brute, and she wants him dead. If she paid Baker $1 million, could he take her husband out for a fishing expedition, get him drunk, throw him overboard and let a shark eat him alive? Please? Pretty please? In capable hands, this moral quandary between right and wrong might have ignited a juicy will-he-or-won’t-he. But writer-director Steven Knight (he penned the equally meh The Girl in the Spider’s Web, Burnt and Allied) has tarted up his movie with unappealing caricatures talking like they’re in one of those old-timey Harlequin romance novels. (Sample line: “Around here…everybody knows everything, but the truth was that nobody knows anything.”) Clarke’s moustache-twirling, booze-swilling villain doesn’t just abuse his wife, he inspects her naked porcelain-skinned body for marks. He’s despicable, leaving audiences to wonder what Hathaway ever saw him in the first place — except that this is neither the time nor place for probing insight. Knight includes every neo-noir cliché in hopes that audiences don’t smell the garbage washing up on the beaches of Plymouth Island. Doesn’t work. The dark and stormy night, the fast-talking mysterious salesman that always shows up at the wrong time and the hyper-violence just come off like hackneyed attempts at bold style. The story never adds up, and worse, it’s not supposed to. We have a desperate third-act gotcha to thank for that, and an overly emotive McConaughey fails to sell it. Serenity might have been savagely funny if all this campy wallowing were intentional. But I think Knight wants us take his film for what it is: A tension-free thriller that deserves to be thrown overboard in January. Lightweight comedies aren’t looking so bad now, eh?